I couldn't copy and paste from this study. The periosteum was sripped from one epiphyseal plate to another. In the 15 dogs studied periosteal stipping either did not enhance growth or slightly increased growth by usually 1-3%. Periosteal stripping did cause bone fractures so that could've been part of the growth cause. Another study where I couldn't copy and paste. This study was done on children and an increase in length following periosteal stripping was seen. Age range: 6-15 years old. The mean overgrowth of the periosteal stripped femurs was 0.70cm. Effects of extensive circumferential periosteal stripping on the microstructure and mechanical properties of the murine femoral cortex. "Extensive periosteal stripping (PS) is a risk factor for post-radiation pathologic fracture following surgery for extremity soft tissue tumors. The purpose of this study was to determine the effects of PS on bone structure and mechanical properties. Thirty-one skeletally mature mice[12-14 week old female] underwent PS, with circumferential removal of periosteum from an 8-mm segment of the mid-diaphysis of the left femur. Thirty-one control mice underwent sham surgery in which the femur was isolated without manipulation of the periosteum. At 2, 6, 12, or 26 weeks following surgery, the left femora were examined by micro-CT to quantify cortical thickness (CtTh), cross-sectional area (CSA), bone volume (BV), and polar moment of inertia (PMI). Three-point mechanical bend testing was performed and peak load, stiffness, and energy to failure were determined. PS resulted in significantly decreased CtTh, CSA, BV, and PMI at all time points. Peak load, stiffness, and energy to failure were significantly reduced at 2, 6, and 12 weeks. There were no significant differences in mechanical properties at 26 weeks. In this mouse model, extensive circumferential PS resulted in sustained changes in bone structure that were still evident after 6 months, accompanied by reductions in bone strength that persisted for at least 3 months." "skeletally mature (12-14 week old) female Balb/c mice"<-growth starts to taper off at 12-14 weeks but we can't rule out growth. "Representative 3-dimensional micro-CT reconstructions of femora from mice that underwent periosteal stripping (PS) or sham surgery (sham). Images reflect observations at 12 weeks but similar findings were seen at all four time points." Periosteal stripping mice are visibly longer although this is just a representation. Surgical technique: Lower limb-length equalization by periosteal stripping and periosteal division.
" The procedure consists of total circumferential stripping followed by transverse division of the periosteum at the proximal, middle, and distal shafts of the femur, tibia, and fibula of the shorter limb. We retrospectively reviewed 11 children with LLD[limb length discrepency] who underwent PSPD[periosteal stripping or periosteal division]. The average LLD was 6 ± 3.8 cm (range, 3-13 cm). The average age of the patients was 9 ± 2.5 years (range, 7-13 years). Orthoroentgenograms were obtained every 6 to 12 months after the surgery. The minimum followup was 24 months (mean, 52 months; range, 24-108 months). Limb length equalization (LLE) was achieved in eight of 11 patients in an average of 25 ± 17.2 months (range, 12-60 months) and was maintained throughout the followup. LLE was not achieved in three children whose discrepancy was greater than 10 cm, however, PSPD helped decrease the amount of the discrepancy in all three patients. No major complications were observed in any patients. PSPD stimulates limb length and LLE is achieved in approximately 2 years after the procedure in the majority of the patients. We believe PSPD should be considered as a surgical option for a LLD up to 6 cm." "Several hypotheses have been proposed to explain the growth stimulation including hypervascularization or release of the mechanical restraint after the periosteal stripping"
[Influence of stripping periosteum on bone formation in guided tissue regeneration]. "10 mm long segmental defects were created in the diaphyses of both radii in 24 New Zealand rabbits. The defect on the control side was covered with a silicone membrane shaped as a tube. On the experimental side, 10 mm periosteum of both sides of the defect was stripped and the defect was covered with a silicone tube. The animals were killed at the 3rd day and the 1st, 2nd, 3rd, 4th, 6th, 10th, 12th weeks. Samples were treated for radiologic and histologic examinations. (1) periosteal stripping exerts no effect on callus formation in or out of the tube. (2) osteoblasts in the cambium layer of the periosteum come from bone surface, endosteum or the Haversian envelopes. (3) the tissue in the two layers of the periosteum has different origins, the fibrous layer comes from soft tissue and osteoblasts in the cambium from bone surface or Haversian envelopes. Stripping periosteum has no influence on bone formation in guided tissue regeneration." Unfortunately I couldn't get this full study. 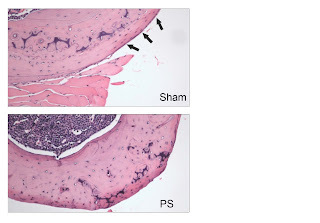 Bone growth and modeling changes induced by periosteal stripping in the rat. "In this study, the changes in longitudinal bone growth and metaphyseal modeling induced by mid diaphyseal periosteal stripping in the rat femur were analyzed by means of histomorphometrical techniques. One hundred forty-four male 30-day-old Sprague-Dawley albino rats distributed in 4 groups of 36 were studied: a control group, a sham group, a group with middiaphyseal right femoral periosteal stripping, and a group with a polyethylene ring wrapped around the stripped zone. The animals were euthanized at 1, 2, or 4 weeks from the start of the experiment, after double tetracycline labeling. A statistically significant, albeit small, longitudinal overgrowth of stripped femurs was observed after a latency period of 2 to 4 weeks. The metaphyseal diameters were greater in stripped femurs than nonstripped femurs. This finding was associated with a lower osteoclastic index in the external metaphyseal surface and with a lower bone formation rate in the internal surface of the metaphyseal cortex." Couldn't get this study either. So stripping periosteum reduces bone resorption on the external metaphsyeal surface and reduces bone formation on the internal metaphyseal surface. So more bone is being formed on the external metaphyseal surface. Would this increase height? Periosteal stripping in achondroplastic children. Little effect on limb length in 10 cases. "We present a prospective study of the results of periosteal stripping and division in 10 achondroplastic children. A single limb (femur and tibia) was operated on and the change in actual length of each bone and the percentage change in growth compared to that of the non-operated limb was measured by scanogram. The mean absolute increase in growth was small, measuring 3 mm for the femur and 2 mm for the tibia. There was no measurable growth difference after 18 months. This method of increasing limb length in achondroplastic children prior to definitive and extensive lengthening procedures is not recommended." Usually achondroplastic children have elevated levels of FGFR3 decreasing height so maybe periosteal stripping doesn't work if FGFR3 levels are too high or the periosteum is a limiting factor. If the periosteum is limiting your growth removing it will increase height. If something else is limiting the growth then periosteal stripping won't affect height.